Norton, one of the most popular antivirus software Antivirus is now available as a free download with 6 months of subscription. 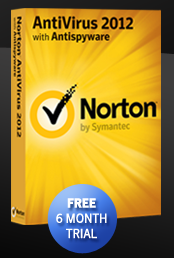 Thanks to Facebook for teaming up with Symantec and providing Norton Antivirus 2012 for free to all its users. To grab your copy of Free antivirus, point your browser to http://us.norton.com/ps/loem/EN/Facebook/index.html and click on the download link. Without asking for any personal details or registration the download starts and you can follow the on screen instructions to install the antivirus. The antivirus is compatible with Windows PC and MAC OS. I tried installing on Windows 7 and the installation process started without any issues. But on Windows 8, the installer stopped after verifying the system requirements. The special offer also extends to Norton 360 which is available 50% discounted price. The original price for 1 year subscription of Norton 360 is around $90 and for Facebook users it’s available at $44.99. Update: Facebook is in partnership with many other antivirus vendors and providing antivirus software for free of cost. The other products are available for 6 months or more free subscription are: McAfee, Sophos Antivirus, Trend Micro. Please visit Facebook Security AV Market place for more details.